For many the FA Cup is now about as magical as a night in with Paul Daniels and Debbie McGee. Premier League clubs whinge about congested fixture lists getting in the way of an ambition to finish 12th in the top-flight table. Premier League managers field reserve teams to preserve star players for forthcoming matches against the likes of Crystal Palace and Norwich. Trophies and a fabulous day out at Wembley are less important than the single-minded pursuit of hard cash. The only link to ‘magic’ is to try and make the FA Cup disappear. But for 15 frantic final minutes at the Hawthorns yesterday (January 30) the grand old competition was shown at its most glorious best, almost entirely thanks to the efforts of the ‘plucky underdog’, a Cup cliche often trotted out to liven up media previews of contests thought likely to be one-sided. Posh are 37 places below West Brom in the football pyramid, not that you’d have known it yesterday. 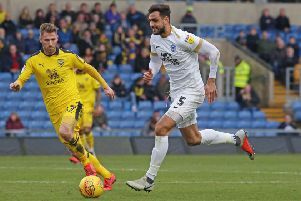 Roared on by a spine-tingling display of passion and support by 4,000 visiting fans behind a goal, Posh twice came from behind to claim an unlikely replay from a 2-2 draw. Shaquile Coulthirst’s 79th-minute equaliser was greeted with a celebratory dance, before substitute Jon Taylor’s terrific, game-saving finish four minutes from the end was the cue for unconfined joy led by the scorer’s rush into the arms of the man who had dropped him from the starting line-up a couple of hours earlier. But possibly the most impressive aspect of this result - aside from fighting back against a side managed by pragmatic Tony Pulis - was a refusal to accept their status in the tie. Posh often passed the ball better than their so-called superiors and spent so much time in the opposition half after the break, a draw was the least they deserved. Pulis, a man for whom entertainment is way down on a priority list, was probably over-egging the pudding by describing Posh as ‘brilliant’, especially as he went on to damn them with faint praise by saying he couldn’t see them scoring. Posh were at first dis-jointed by some surprising team and positional changes, and would have been out of the tie inside the first 30 minutes had goalkeeper Ben Alnwick not bailed out a dreadful attempt at dribbling out of defence by Ricardo Santos with a superb save from James McClean, but after the break they were largely dominant, even if clearcut chances were rare until Coulthirst pounced on Michael Bostwick’s long diagonal ball, and some defensive dithering, to poach his first Posh goal. Posh boss Graham Westley of course loves the Cup. For a start it can bring welcome attention and riches to lower division clubs. It’s also often the best opportunity to showcase playing and managerial talent, and in Westley’s case yesterday that talent including hitherto unknown drama skills as he fell to the ground as through shot when the match ball burst in front of him. Westley also rescued his starting line-up from an indifferent first half, which involved just a couple of off-target shots from strikers Coulthirst and Lee Angol, by making two telling substitutions at the break. Taylor’s introduction was justified by his sweet finish after Santos, by now at right-back, had nudged another fine Bostwick pass into his path, but equally important was the abandonment of an experiment of playing Jack Baldwin in a midfield holding role and returning him to the centre of defence alongside the imperious Bostwick - surely this is now the first-choice partnership for the rest of the League One campaign? Martin Samuelsen’s arrival helped Posh retain possession better and the hugely-gifted on-loan 18 year-old often toyed with Premier League markers. He almost secured Posh victory in the final moments when his dancing feet defeated two defenders before a powerful strike was disappointingly sent straight at home ‘keeper Boaz Myhill. Now a goal then would have increased the volume of the final-whistle boos around the Hawthorns, a place which appears to have seen much of the joy of football sucked out of it, presumably by low-quality, dull performances. Even the return to action of sulky striker Saido Berahino didn’t thrill. Berahino, who spent a decent spell on loan at Posh four years ago, scored twice and yet couldn’t have looked less happy. His goal-celebrations were low-key and not because of any affection for a former club. His overall performance on his first start since Hallowe’en was nothing to excite January transfer window predators, but his finishing might have done. Berahino beat Alnwick with a precise 22-yard strike (two passes after Harry Beautyman had carelessly lost possession just inside the home half) in the 14th minute and looked to have won the tie four minutes after Coulthirst’s goal by pouncing on Taylor’s failure to clear a right-wing cross and shooting into the opposite corner. His second goal would have won the game, but for Posh’s self-belief as well as their fighting spirit. The Baggies also came close to pinching victory in added time as Craig Dawson lifted a near-post corner over the bar and Bostwick, who was making his first appearance of 2016, was forced into a great defensive block to thwart home substitute Victor Anichebe. So it’s onto the fifth round draw tonight when Posh will know exactly what they have to do to reach the last-16 stage for the first time since 1986. They may well have missed their best chance to win this tie anyway. One presumes the replay with West Brom on Tuesday, February 9 will be televised live. Before today’s games Posh will be choice number two for the unimaginative TV stations behind a reserve team game between West Ham and Liverpool. TV schedulers, another species who have managed to devalue the greatest knockout competition of them all. Posh: Ben Alnwick, Michael Smith, Lawrie Wilson (sub Jon Taylor, 46 mins), Michael Bostwick, Jack Baldwin, Ricardo Santos, Harry Beautyman (sub Martin Samuelsen, 46 mins), Chris Forrester, Erhun Oztumer (sub Marcus Maddison, 61 mins), Lee Angol, Shaquile Coulthirst. Unused substitutes: Souleymane Coulibaly, Leo Da Silva Lopes, Andrew Fox. Dion Curtis-Henry. Posh - Coulthirst (79 mins), Taylor (85 mins). Cautions: West Brom - McClean (foul). Posh - Smith (foul), Angol (foul).